For some of us, clothes are simply garments that we wear, a social necessity, a uniform that changes daily depending on the weather and our surroundings. And if they fit comfortably and look nice, that’s a plus too. But for Beau Lawrence, clothes are so much more than that. They are a second skin. “Fashion brings together some of the most basic needs that people have, with the ability to make people feel good about themselves by the way they dress,” Lawrence said. “It gives me a higher sense of being and fulfillment. Lawrence celebrated the grand opening of Ace Rivington, his denim and homespun French terry sweatshirt shop at 1114 State St. #25, on Thursday night, the culmination of a dream that began more than three years ago. When his daughter was 6 months old, he uprooted his wife and family from Los Angeles and moved to Carpinteria to start his own clothing shop. Last November he opened a tiny clothing shop in Santa Barbara’s Funk Zone, and then in July launched his latest shop in La Arcada downtown. The store is adorned in men’s denim jeans that cover the walls, along with the sweatshirts made out of terry cloth. He said the cloth reminded him of the blankets his grandmother weaved together for him as a child. When he touched the material, it took him back to another time, and made him feel safe. Lawrence has taken his store a step further, creating a fictional narrative that is part of a larger story, which he hopes to one day turn into a television series. The name of the store, Ace Rivington, is character hatched in Lawrence’s creative mind. Rivington is an adventurous pilot who travels the world, in denim jeans, of course. Ace is a cool pilot’s name, he said, and Rivington is a combination of A River Runs Through It (Ace is also an accomplished fisherman) and Remington guns. The Santa Barbara store is decorated in a Cuban theme — Rivington is visiting Cuba at the moment. Lawrence sprays the store with fragrances and aromas, such as the Whiskey Tobacco Rose, which he sells for $160. Rivington’s next destination is Paris, which means the next store Lawrence opens will have a Parisian theme. “That’s a great pair of date jeans,” he says, pointing to a pair of $158 dark, clean, slim-tapered denim jeans. The most expensive jeans he sells cost $298. They are made in a factory in Los Angeles. When Lawrence was in college, he had dreams of becoming an architect, but then gravitated toward clothing design, landing a job at Guess Jeans, before eventually moving up the ladder to become mens jeans wear head designer global. Now, he said, “the apparel patterns are my blueprints.” He even has a sewing machine at the shop and will tailor the clothes he sells to create the perfect fit. 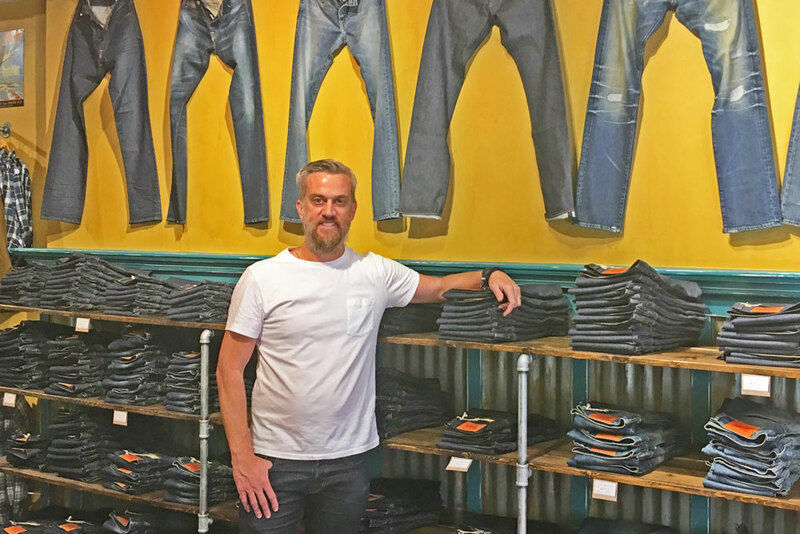 “My goal is to be the most important denim tailor on the Central Coast,” he said.